So the three tomato plants are now producing fruit. We have not been watering them regularly. Its been hot and dry for the most part. The tomatoes taste so good. A garden grown tomato cannot be matched. This is great, since we have been too busy to dote over the garden, and yet it is doing very well this year. Our cucumber patch consists of one plant. Does anybody want a cucumber? For us its cucumber salad with a few slices of tomato with a little olive oil, pepper and balsamic vinegar. And for lunch its Rye bread with a bit of olive oil, cucumber slices and some freshly ground pepper. Anymore said will put us at risk of becoming a foodie blog at this point. We are not gardeners or foodies, but we feel strongly feel that if you can grow your own food when you can or if you can, go for it and to not miss this important part of living on this earth. Of course, most of the property is devoted to native sun loving wildflowers. 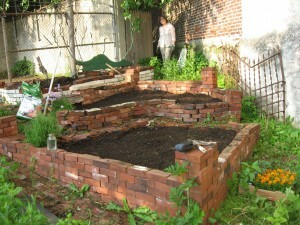 Someday more vegetables may be grown, as we build up the raised beds and continue to improve the place. A kind friend of ours gave us root segments of the native Wild Bergomat and the Tall Coneflower a few years ago, which have taken off and have created a beautiful setting for our vegetable garden. This is our green bean patch. For some reason, most of the bean seeds we planted did not grow. However, the 5 plants that did grow have provided us with a massive amount of beans! We have been chopping them up with onions and garlic and sauteeing them. Also just eating them right off the plant on site is very enjoyable. 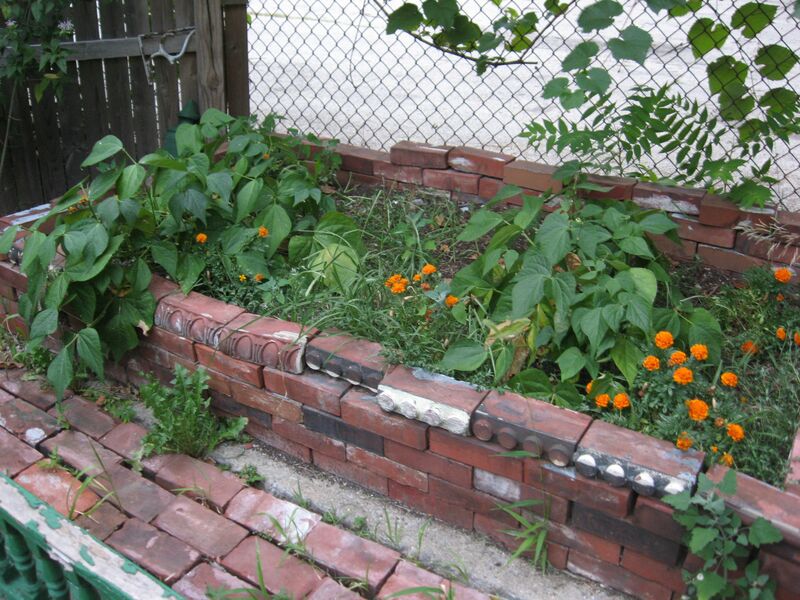 The bricks that line these raised beds come with a heavy heart. They were at one time the building blocks of once majestic buildings in the neighborhood that we would rather have standing today. 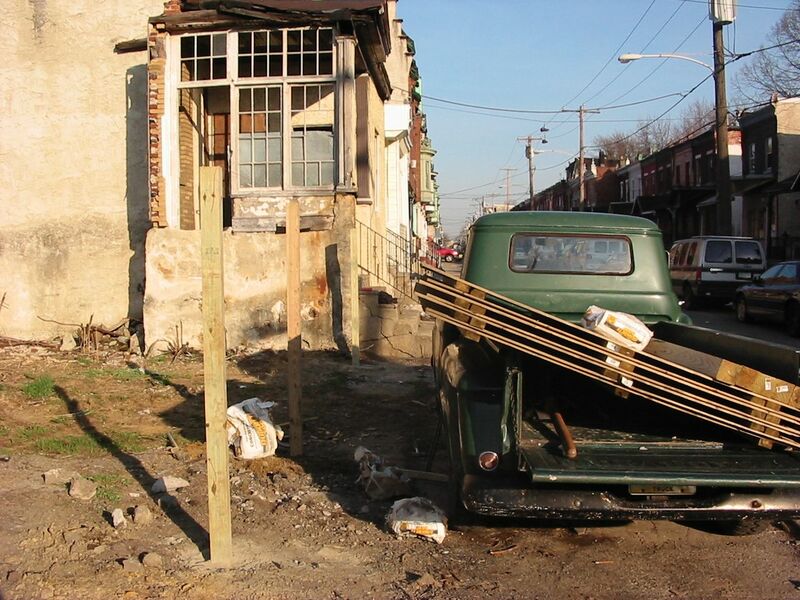 However the economic situation in the city of Philadelphia in the past 50 years has blighted sections of the neighborhood and has led to the demolition of some once grand Victorian-era homes. With the census data out, it has become official: The City of Detroit Michigan has reached an unprecedented loss of population for a major American city in the country’s history. The economic turbulence in America has been drastic and the large and medium sized cities of the north have undergone dramatic changes. Cities such as St Louis, Buffalo, and Detroit have experienced heavy blows across wide sections of their boundaries with an unsettling level of abandonment. Large cities with diverse economies such as Chicago, Philadelphia and New York have experienced severe dis-investment and blight in certain sections, leaving a divided and scarred urban landscape. The condition of formerly bustling industrial urban centers of America is an issue that has become unavoidable at this point in time. We are at a turning point as a nation as to how we should accept the situation; how do we change the economy- and how do we absorb these problems in a constructive manner and not run away? Above is a scene very typical in Philadelphia during these rough times: An abandoned house and a vacant parcel of land immediately adjacent. What will happen to this forgotten part of our society? Is this what America has come to? The societal issues and the environmental consequences are not always combined in the standard analysis of these times. However in urban areas, the abandoned land has been so severely disturbed that it often becomes a surreal world of invasive vegetation, crowding out native vegetation and consequently native insects that require native vegetation, and subsequently native birds and mammals. The remaining residents of these derelict cities or parts of cities are left in an unknowable fearful state full of abandoned properties and noxious weeds. Nature itself becomes a reflection of society’s ills for those with no choice but to stay or those who want to stay for the love of their neighborhood and community. The invasive exotic Ailanthus altissima, the Tree-of-heaven grows rampantly and aggressively in every corner of the neighborhood, from vacant lots to back yards and out the sides of houses, rooting itself into masonry walls and stone foundations. This invasive has created an image of trees as a horror. The Ailanthus has done much damage on the city of Philadelphia, destroying buildings and properties, as well as outcompeting native trees and creating a monolithic landscape of problematic fast-growing trees, that have easily broken branches that cause property damage, and create an unpredictable and menacing tree-scape for urban dwellers already stressed from economic changes resulting from de-industrialization. 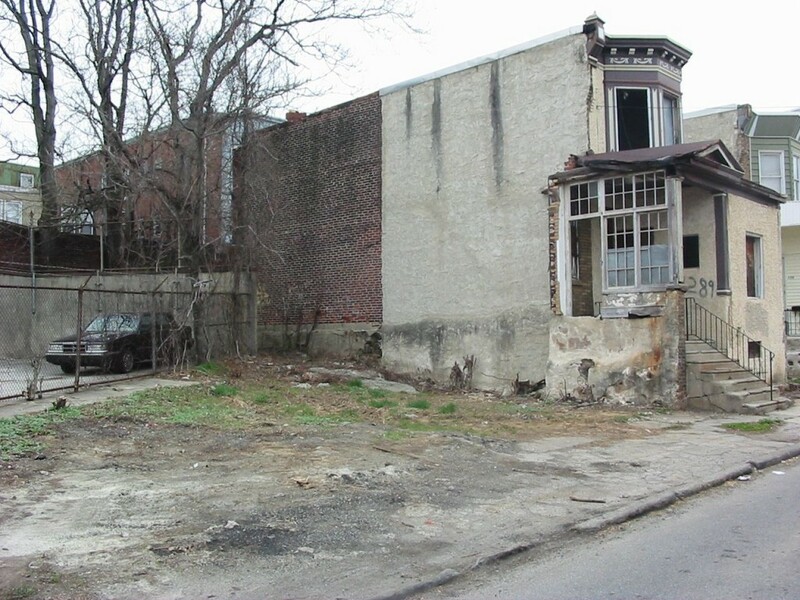 With a long experience of all of these issues, a vacant lot in our fair city of Philadelphia was purchased at a Sheriffs sale auction for the sum of $7, 100 dollars. The property was thoroughly blighted. ( discarded diapers, and refuse so distasteful that we will spare you the details- along with the usual blown-in trash such as years of fast-food containers, soda receptacles, dumpings ranging from old plaster to concrete, liquor bottles, etc. To this day, 6 years after aquiring this property, we are still removing trash that has accumulated. This 2100 square foot property was purchased with the sole intention of helping revitalize the block. 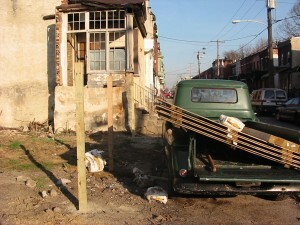 This property was the first thing one would see when entering the block on the one-way street. From a Feng-Shui perspective, nothing could be of utmost importance to improve. The first order of business was to build a fence around the property. The nice new fence created a positive mood in the neighborhood. Something constructive was happening. 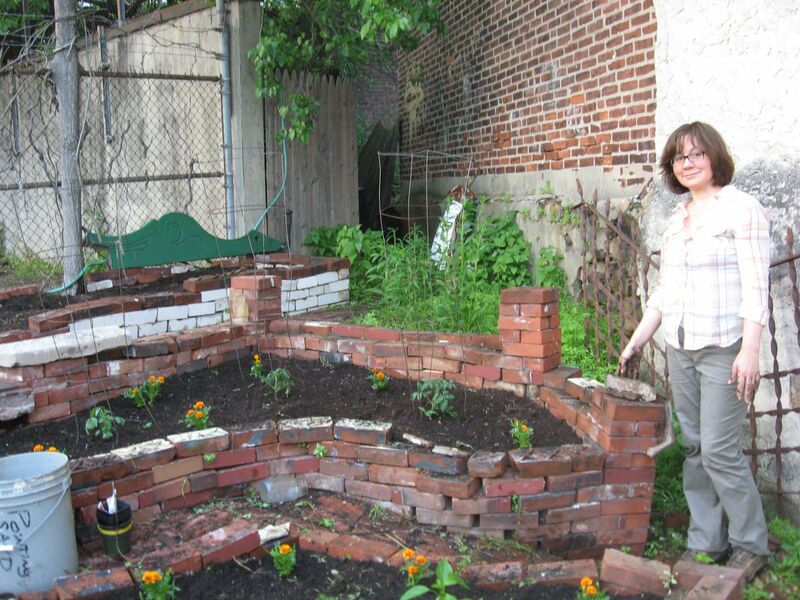 The idea of a vegetable garden resonated with people, and soon there was a continual stream of positive re-enforcement that continues to this day, 4 years later. From the above picture, the posts have been set and the fencing material awaits its installation. All kinds of ideas for complicated and elaborate fences were entertained, however the reality of the situation demanded a fence that was to actually be erected within budget and now, not in five years, or even ten years when the fantasy fence could possibly materialize. 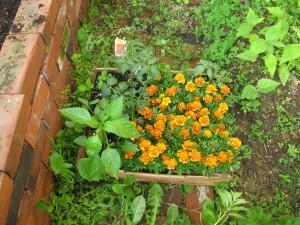 This was an introduction into the world of urban vegetable gardening. There were so many difficulties before us: The property’s blighted state, the need for good soil, the need for raised beds. There was in the past an auto body shop at the adjacent property. We cannot assume the soil on our property is not contaminated with carcinogenic chemical plumes. On top of that, there used to a house on the land. No doubt it was painted with lead paint. Being that it was demolished, it must have been in an severe state of deterioration, which means the lead paint most likely flaked off into the soil. Then soil was brought in to fill the basement hole. Who knows where that soil came from. 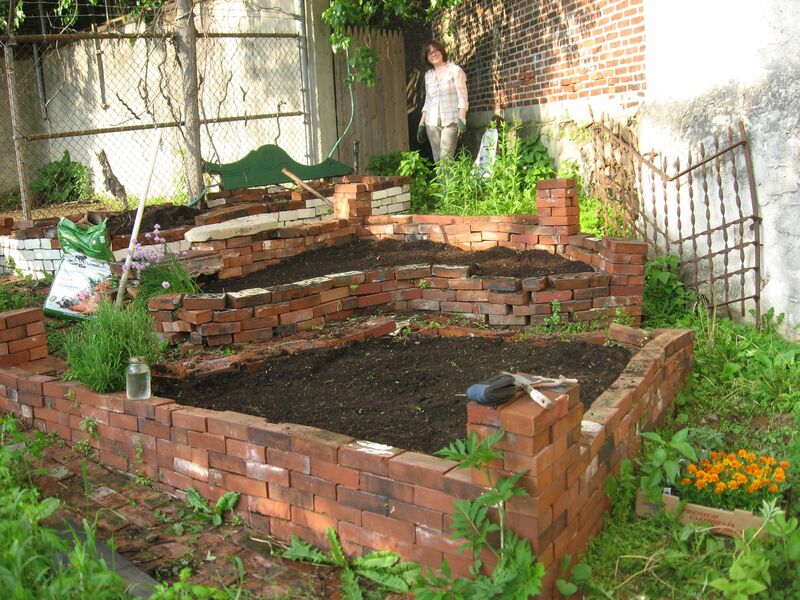 This is a situation where we use bricks from nearby demolished buildings to build raised beds filled with leaf compost collected by the City Of Philadelphia. 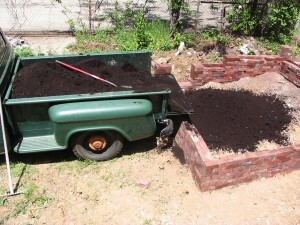 Basically the formula is thus: Build a raised bed using hard material available, often concrete or brick found on demolition sites (right on the block) . Use this discarded material to build a wall about 15 inches tall and then fill this area with soil. Before the market crash of 2008 this material was free from the Fairmount Park recycling center. Now it is sold at a modest charge. Its now 2011, and we still own and garden this property purchased over one half of a decade ago. 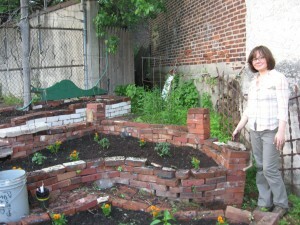 Our fence has improved the block, and our vegetable garden still gives us food and a sense of place. 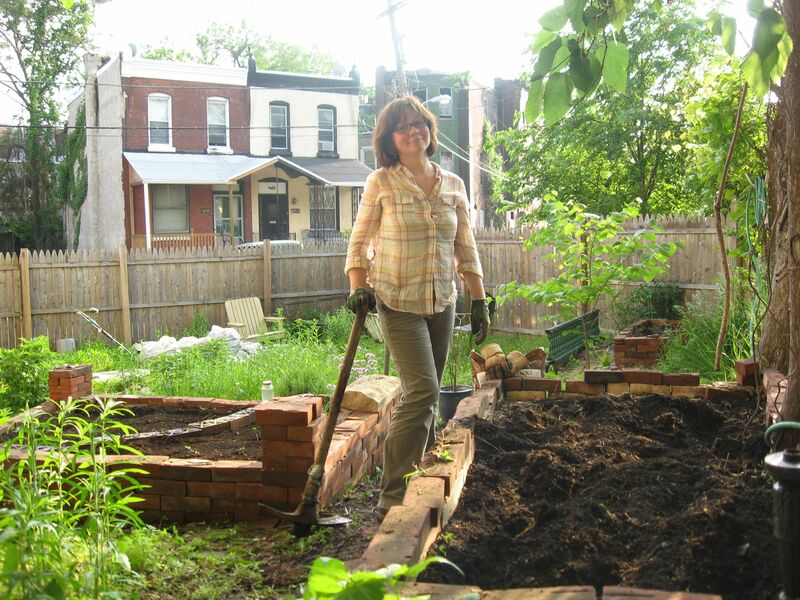 While this exercise is taking place, now is the time to plant the seeds of food and cultivate the crops that feed households, neighborhoods, communities, possibly cities, during a short period of the summer months. We are just a part of the cacophony of voices to be heard in these crucial times: This land is ours, will we grow our food and live in freedom ? Our stewardship of the land is our true ownership. Can we grow our food here? Will it be taken away from us? What if we want it to be a nature preserve, a natural wetland, an upland forest, an open meadow, a steep slope, a farm or garden? 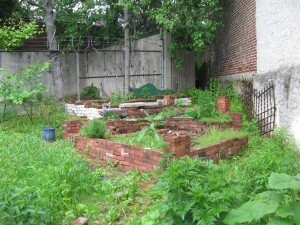 Cultivation of food is the issue in the urban realm. Massive amounts of land are being abandoned. 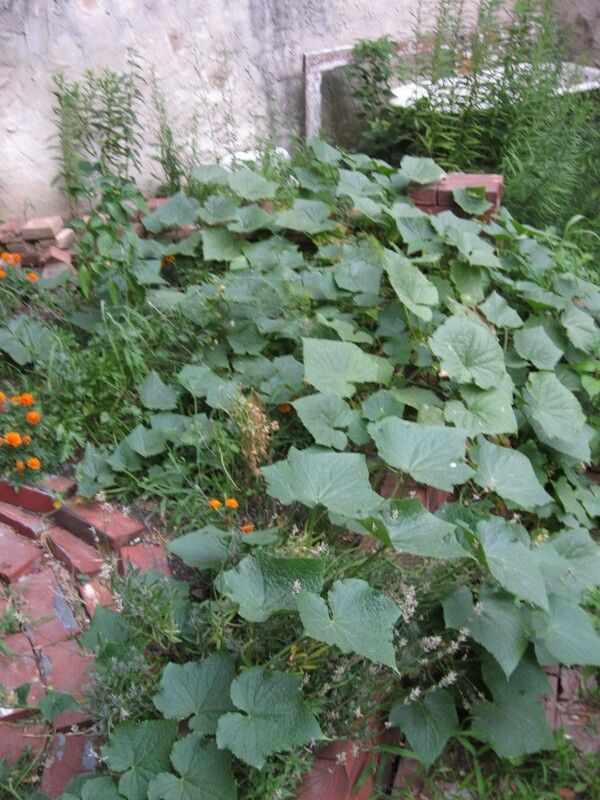 There are many plants willing to grow that are invasives. We need to understand these changes on the most immediate and visceral level, and succeed at making changes in land management. Gardens of cultivation recognize the value of land space and the need for vegetables as well as the invaluable asset of gardening in an of itself, to the American worker, our own citizens lucky enough to have a job or creative enough to make jobs available in our country; to all of us hardworking and enduring citizens, the garden is our spot where we can put a seed in the dirt and watch a plant grow and create a bean, a tomato, maybe even a carrot root or a beet. It is here at this juncture, where we not only grow cultivated plants but encourage them to be propagated for horticultural purposes where we fully emphasize the American urban Garden. Grow as much as your own food as you can. The highly disturbed urban landscape is ideal. 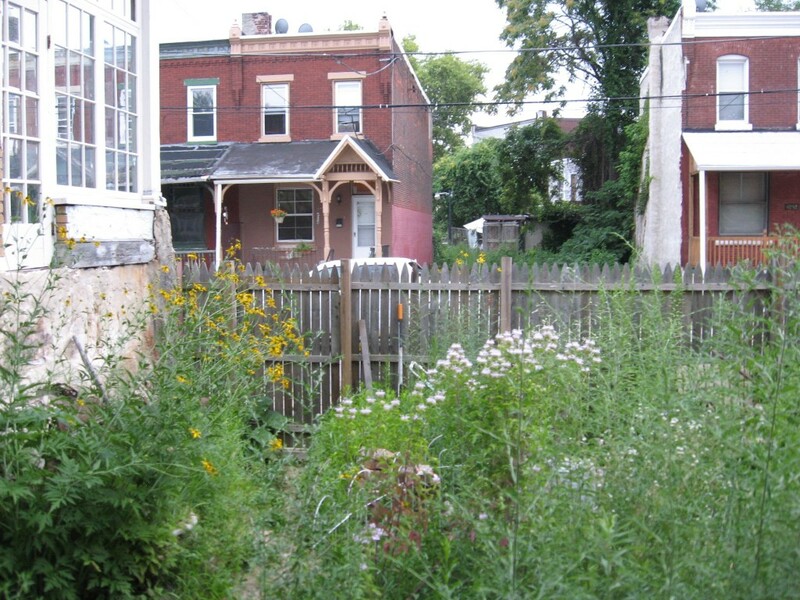 The more food you grow and share with your neighbors, the more you are contributing to the natural ecosystems of your home. 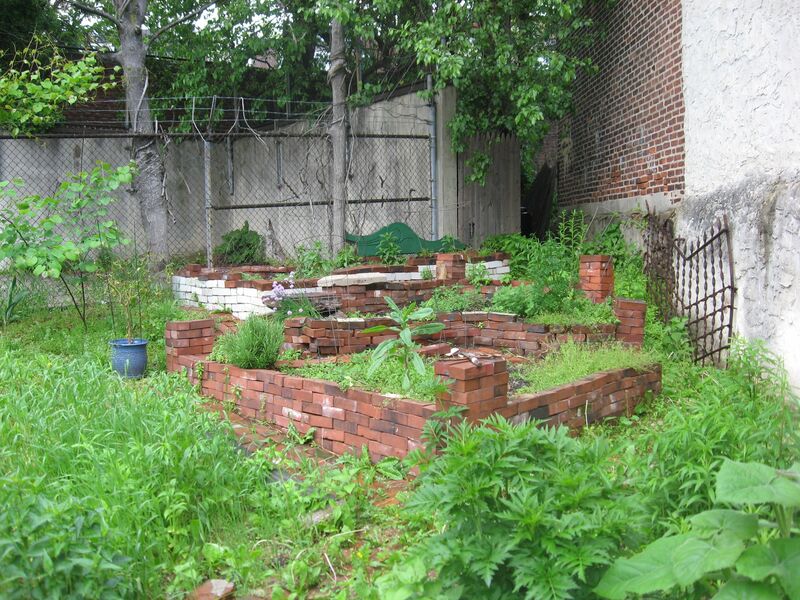 Using previously disturbed abandoned urban land to grow food is sustainable. It is the recycling of land. In the same way we recycle glass and paper, it is economical and better for the environment. The worst case scenario is for previously undisturbed or even mildly disturbed natural land be taken for development. The best case scenario is that previously developed land that has been abandoned be recycled and used for agriculture, or even green space such as urban mini-parks that can serve the many distressed communities throughout the de-industrialized cities. The native plants will fill in the empty spaces of your vegetable garden and you will not mind at all. Plants have always been an integral component to our lives. Now there is much confusion over their role. We need to recognize the importance of plants in our lives over everything else. Now four years later, we just keep going along. 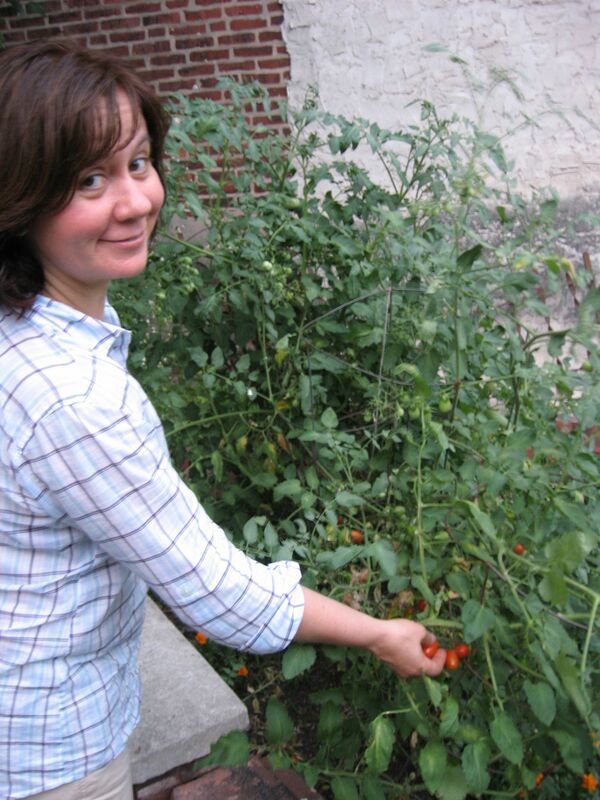 Tomatoes , Peppers, Basil, Cucumbers, Green beans… We want to eat fresh food we grow ourselves. And this is shared in the block. The ideal is that everyone can have this experience, imagine a world where every person has some direct control over their food source and likes that situation. Imagine a world where everyone around you for hundreds or even thousands of miles in every direction is properly fed, satisfied with their place in life, has a positive attitude about their future and is eager to better our world in some way… This is our neighborhood. We have been at it for 4 years now. 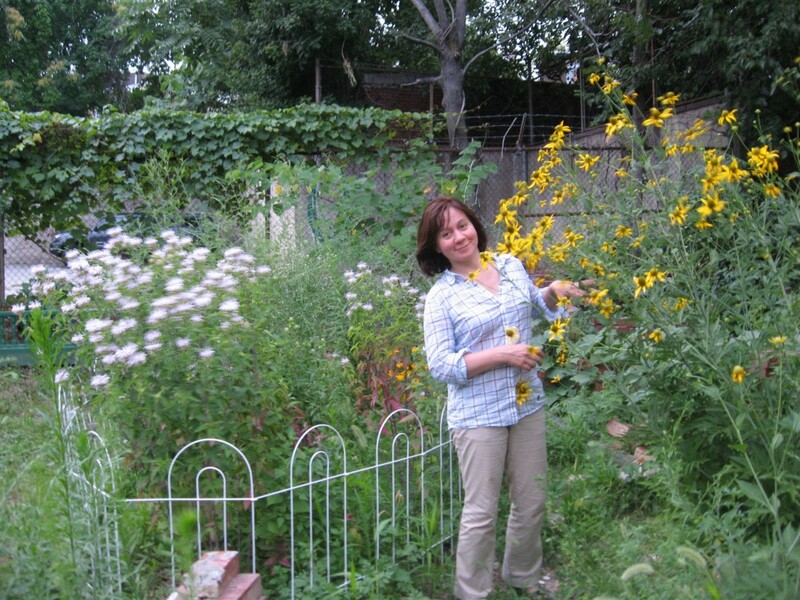 The garden is a established presence on the block. We grow tomatoes, peppers and basil. We are not expert vegetable gardeners. We do our best to get it going around May 15th. The fact is that we usually end up buying little potted plants from the garden center and spend the next few hours tilling the soil and plopping the little plants in the dirt. Usually that works out, and we get some product in a few months. We’ve had some pretty pathetic results over the years though. We did grow tomatoes from seed once. 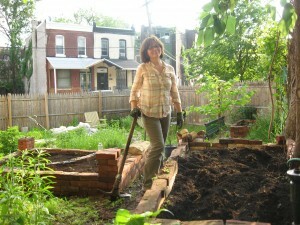 The Sanguine Root is not a vegetable gardening website, at least for now. We are still enthusiastic about the subject, and we encourage everyone to try a hand at gardening a vegetable. Buy that little tomato plant at the supermarket or home center and stick it in a bucket or in a piece of dirt you may have control over, water it and see what happens. If you have been gardening over the years and this year you are overwhelmed with work , and the yard has a million overwhelming weeds, and you never started your tomatoes from seed, and you are so behind…. we say forget about your troubles. Go out and buy a few little plants, cheat a little, as we like to say and get those little guys in the ground. In August you can go out and pick tomatoes and peppers and make a nice sauce. It is worth it. It doesnt have to be perfect. There is something to be said for an afternoon of poking the dirt with a stick and putting little green things in the dirt. Down the road a bit, the Sanguine Root Vegetable Garden has come a long way. After the fence was constructed and the garden became established, the dilapidated abandoned structure next door was purchased by an enterprising developer and renovated, with a new roof and a new coat of paint, windows and stucco. Occupied. Two once abandoned properties side by side are now recycled and productive. 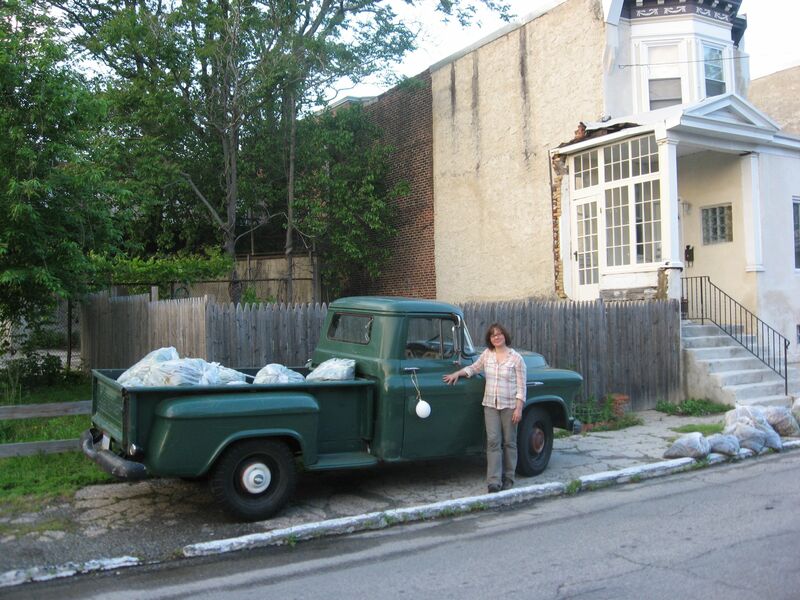 Our 1956 Chevrolet has proven ever so useful in our gardening efforts.